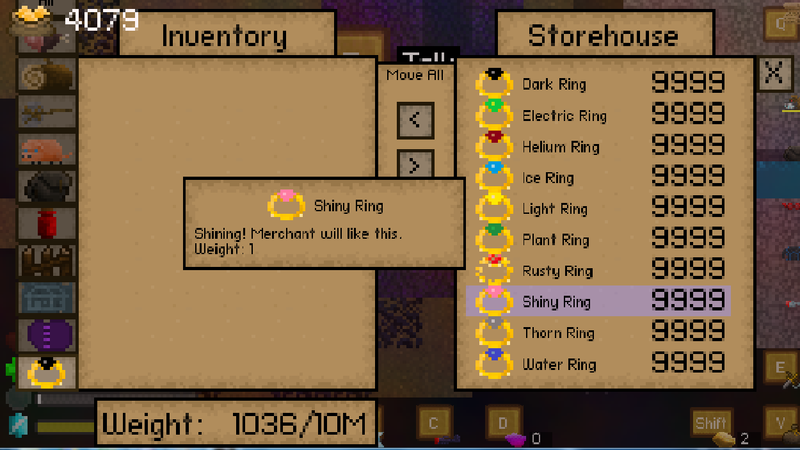 Add ring items and a new ring slot! Talk to the alchemist for more details. I didn't read the speach that the alchemist said to me at the beginning, so i have no indication where to find others rusty rings, can you repeat it? Can you give a hint where to find Rusty Rings? The alchemist gave me one, when I brought him a Helium Pack he combined it to a Helium Ring. The description says it flies, but with only the Helium Ring equipped I can't fly. And do I have to search for recipes or will they automatically be added to the Laboratory? The alchemist gave a clue how to find another ring, you just didn't notice it. And the recipe will be automatically added once you unlocked the ring. Nevermind, I looked at the game files, and while I don't understand anything really well I got a hint where to look. Thanks! this will not conflict with the vampire cape's shadow ring item and bracelet slot?